Fresh fall vegetables from the farmer's market. However it's prepared, the first thing to understand is when each of these delicious fall offerings are in peak season. Here's a full list of fruits and veggies that reach their peaks in late September to early December. A crate of fresh picked apples. 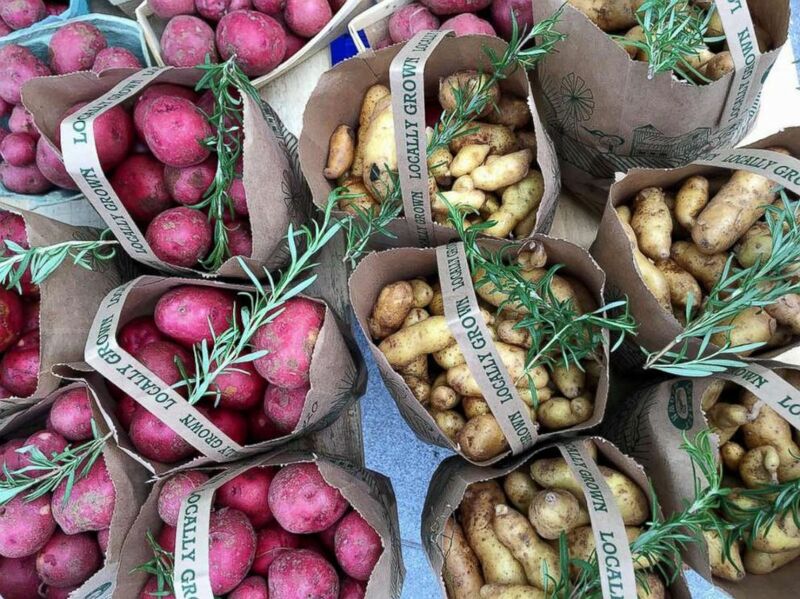 Fresh locally grown potatoes are perfect for any fall dish. Martha Stewart's mashed butternut squash. Stewart cuts the hassle of breaking down root vegetable fibers by utilizing the tool she highlights in her new cookbook "Pressure Cooker." This mashed butternut squash recipe is as simple and silky as it is seasonal and well seasoned. Try this squash side at home this fall in your own kitchen with her full recipe here. Turnips and celery root are at their peak during the fall so this recipe takes full advantage of the seasonal ingredients. 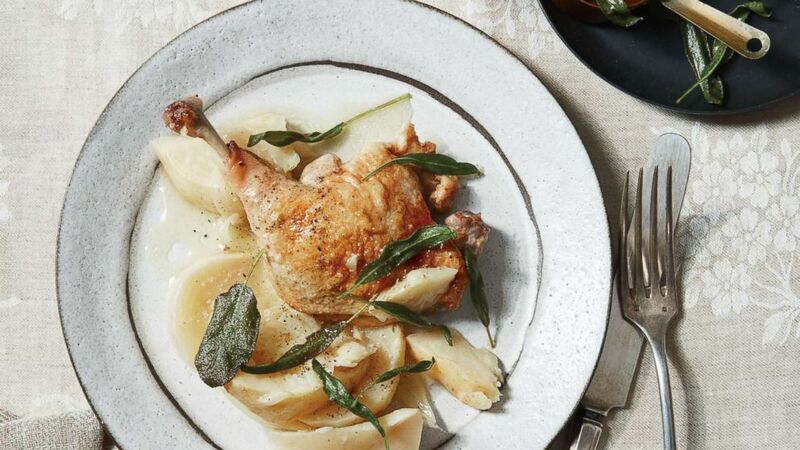 Martha Stewart shared her fall forward braised duck dish from her new cookbook "Pressure Cooker: 100 + fabulous new recipes for the pressure cooker, multicooker and Instant Pot." 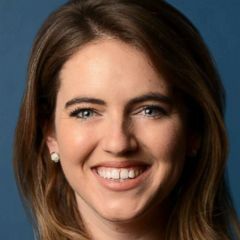 "Duck is a prime candidate for the pressure cooker; its richness and ample juices intensify the ingredients that share the pot with it — in this case, sturdy root vegetables," Stewart says in the book. "Make the most of the desirable duck fat by using it to fry up sage leaves for a crisp finishing touch." Check out Stewart's full recipe for this quintessential fall dish here. 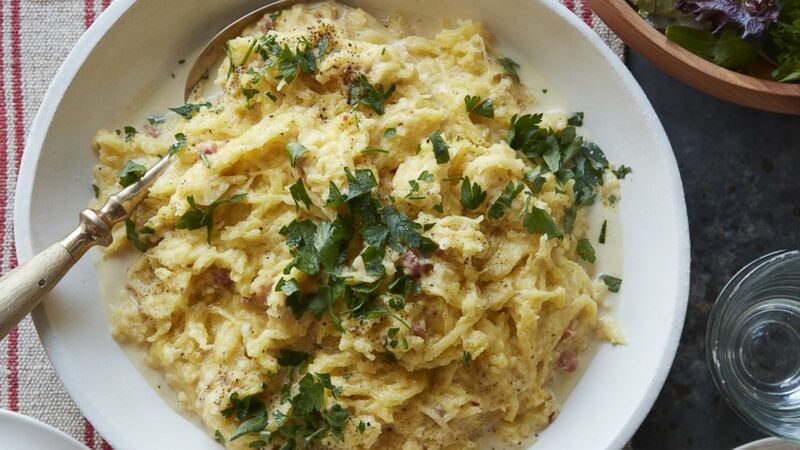 Substitute spaghetti squash for pasta to make a carbonara that is full of fall ingredients. Step aside pasta. Now that squash in season, it's time for this veggie to shine as a main ingredient. This Food Network Kitchen recipe proves spaghetti squash is a perfect base for a pancetta-and-egg enriched cream sauce. Cut the squash in half crosswise using a serrated knife. Scoop out and discard the seeds with a spoon. Put the squash onto a microwave safe plate, cover tightly with plastic wrap and microwave on high until very tender and the flesh can easily be flaked with a fork, 13 to 14 minutes. Use a fork to scrape the sides of the squash into spaghetti-like strands into a bowl. Meanwhile, mix together the Parmesan, egg yolk, half teaspoon salt and a generous amount of pepper in a medium bowl. Cook the pancetta in a large skillet over medium-high heat, stirring occasionally, until crisp, about six minutes. Add the garlic and red pepper flakes and cook, stirring, until fragrant, about 1 minute. Stir in the heavy cream, scraping up any brown bits in the pan, and bring to a boil. Reduce the heat to medium, add the squash strands and toss until well coated. Add the Parmesan mixture and toss to gently cook the eggs and make a creamy sauce. Sir in the parsley. Divide among 4 plates and serve with more Parmesan, if using, and a green salad on the side. 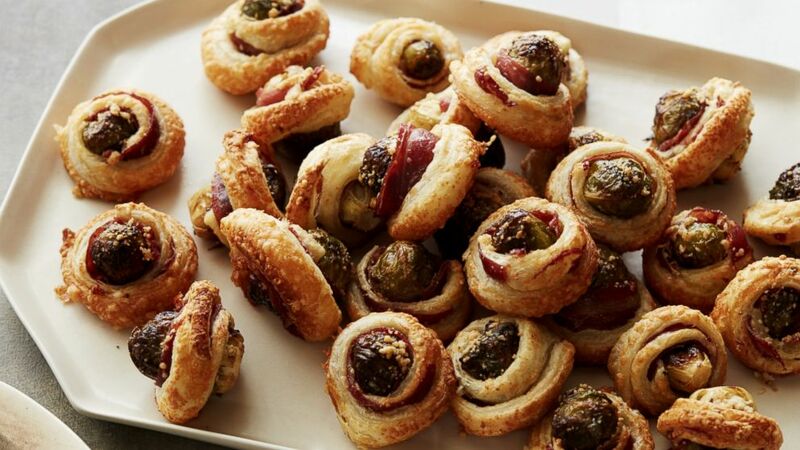 These Brussels sprouts are a fun fall twist on pigs-in-a-blanket with Parmesan cheese and puff pastry. This riff on a classic party appetizer utilizes one of our favorite fall offerings -- Brussels sprouts! Press Parmesan cheese into puff pastry, add a thin slice of prosciutto, wrap it around the Brussels sprout and pop them in the oven! Read the full recipe here to make them at home this fall. 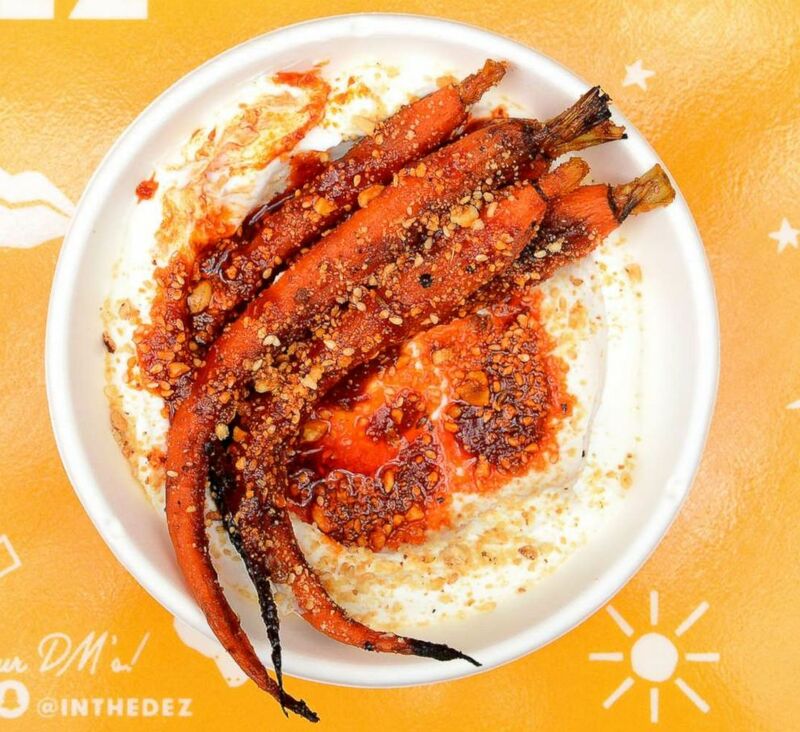 Harissa and honey roasted carrots amps up the flavor on root vegetables. 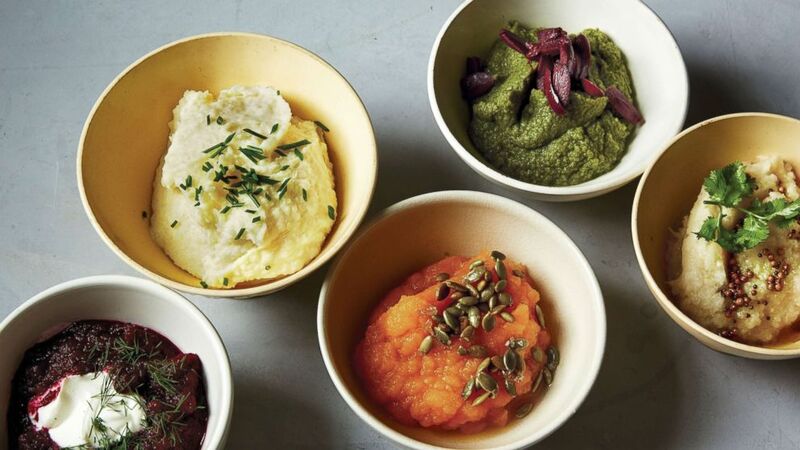 Executive chef and co-founder of Dez in Manhattan, Eden Grinshpan, shared her contemporary Middle Eastern spin on two different fall vegetables. "I love roasting on a very high heat. Getting a little bit of char and good caramelization is key," Grinshpan told "GMA." "Simply dressing the veg in olive oil, fresh herbs, or spices and seasoning really well is one of my faves and the easiest way to prep fall root veggies." Her honey and harissa roasted carrots are a staple on her restaurant's menu and make the perfect fall side dish. For the spice blend: Heat up a pan and toss in the coriander and cumin seeds. Toast for 1 minute on medium-low heat until lightly toasted. Place the toasted seeds in a blender and blend until it turns to a powder. Add in the toasted hazelnuts and salt. Pulse until it turns into a fine crumb. Remove from the blender and add in the sesame seeds. Mix the honey, harissa, olive oil, cumin, salt and pepper in a bowl. Remove about two tablespoons to reserve for garnish and place the rest on the carrots. Toss and place into the oven for 20 minutes and roast until golden and slightly burnt on the edges. To plate: Spread the yogurt or Labaneh on the bottom of a shallow bowl and gently lay the warm carrots on top. Drizzle over the rest of the harissa-honey mixture, then sprinkle on the dukkah. Cauliflower meze is a simple and fresh seasonal side dish. 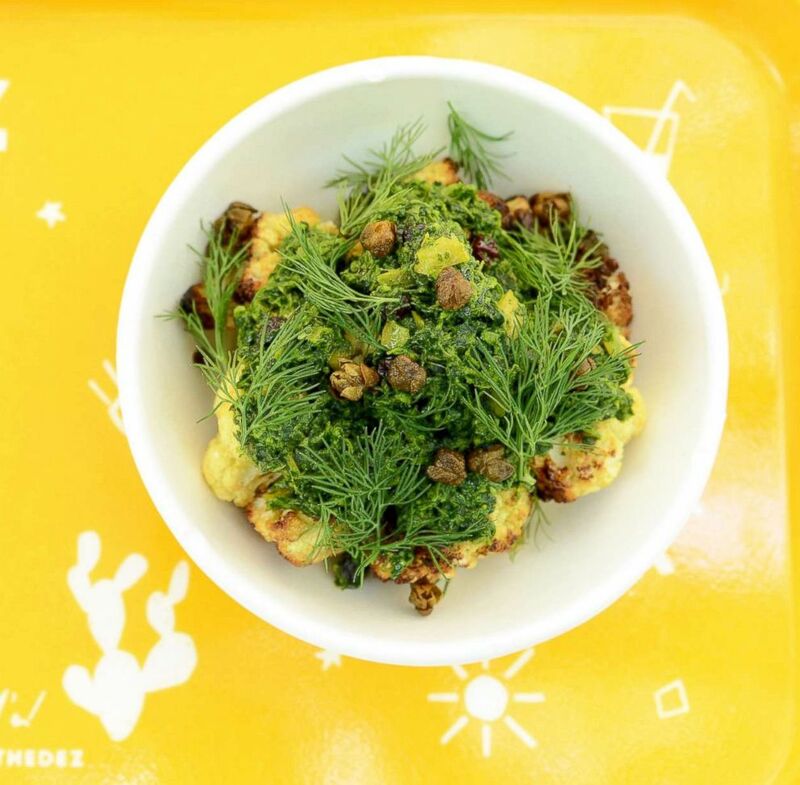 Grinshpan also shared her recipe for cauliflower meze that's roasted to golden perfection and topped with fried capers and lots of fresh dill. Get the full recipe here. Fall produce offers plenty of opportunity to create hearty, main-course salads. And nothing says autumn quite like butternut squash and pumpkin. Combine them like Martha Stewart does and it's a recipe for flavorful success. Check out this recipe and other delicious fall favorites in her new cookbook "Pressure Cooker." Directions: Heat one teaspoon oil in a skillet over medium heat. Add pumpkin seeds; cook, stirring frequently, until seeds begin to brown and pop, three to four minutes. Remove from heat, and season with salt and pepper. Chop garlic and add half a teaspoon of salt. Mash into a paste with flat side of a knife; transfer to a small bowl. Add vinegar, coriander and half a teaspoon of pepper and whisk to combine. Slowly whisk in remaining six tablespoons oil. Transfer warm, cooked butternut squash to a serving dish. Toss with dressing and top with pumpkin seeds, scallions and cilantro and serve. 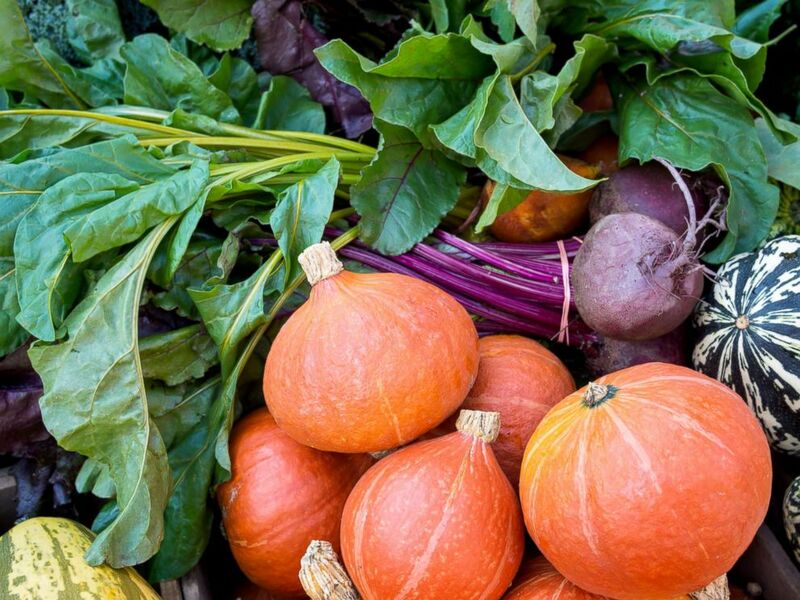 Executive chef and owner of Pig & Khao and Piggyback Bar Leah Cohen, who was a featured "GMA" fierce female chef, shared the perfect recipe for fall veggies. Tofu vegetable curry with kale, eggplant and cauliflower. Make this dish ahead of time and let the depth of flavor and warm spices meld together to create a hearty and healthy curry that's peak fall. Heat up oil in a large saucepot. Add the oil and toast the curry powder. Add the onions, garlic and ginger and cook until soft. Add the soy sauce and brown sugar. Add the coconut milk, Serrano chili, tomatoes and eggplant. In the meantime, roast the cauliflower (cut into bite size florets) in the oven at 400 degrees lightly salted an oiled. At the same time bake the tofu in the oven at 400 degrees lightly oiled and salted. Once the eggplant is cooked, add the kale and cook until just wilted then take off the heat. Add the Thai basil and season with lime juice. To plate add some cauliflower in the bottom of a bowl and pour the curry on top. Then finish by adding the tofu and serve with coconut rice. Pumpkin and cranberry compote pancakes. Combine with wet. Allow the Flaxseed Meal to hydrate for 10 minutes. Add the wet mix into the dry mix and whisk until just combined. Do not overmix. If the pancake is too loose, add in more flour, 20 grams at a time until it is batter consistency. Cook on top of a med hot griddle that is greased with nonstick spray. When pancakes begin to bubble, flip them over. Cook one to two more minutes on the other side. 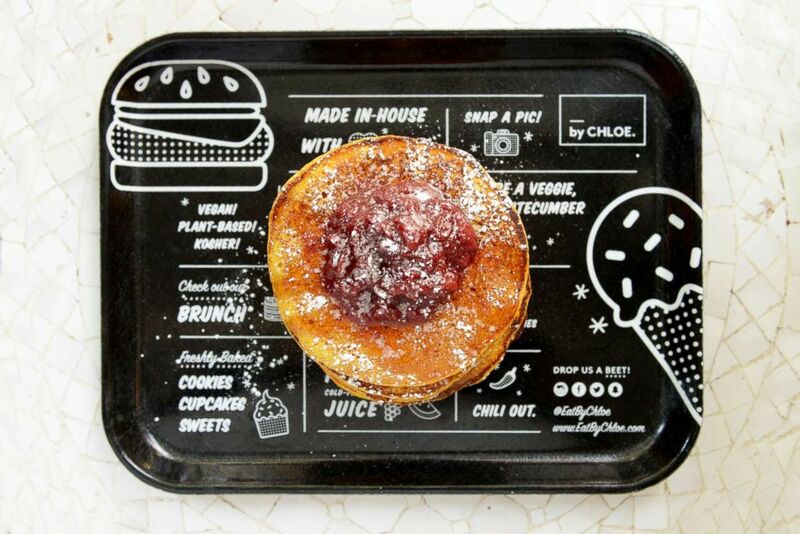 To serve place two pancakes on a plate. Garnish with one scoop of cranberry compote. Finish with a dash of powdered sugar. Wasser also shared her recipe for a shiitake "clam" chowder that's completely vegan and gluten-free. She uses a whole head of roasted cauliflower and almond milk to create a dairy-free creamy base for this fall soup. Make the silky soup at home with Wasser's recipe here. 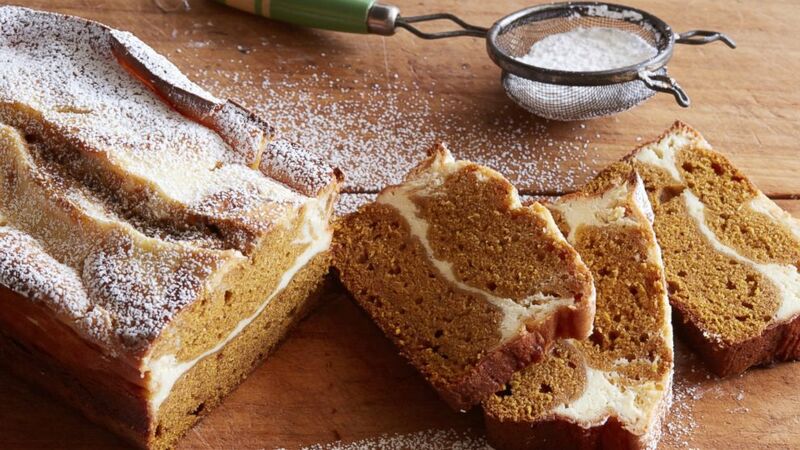 This fall favorite pumpkin bread hides a rich swirl of cheesecake. This fall favorite has a sweet and creamy ribbon of cheesecake swirled throughout the pumpkin bread to add a luscious bite to this classic baked good. Get the full recipe from Food Network Kitchen here. Pumpkin Pie-Stuffed Cheesecake from Food Network Kitchen is the perfect fall dessert. 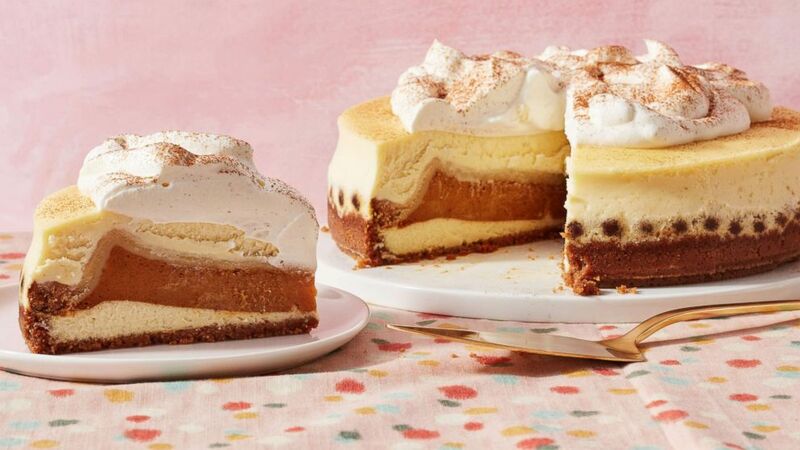 This decadent dessert combines sweet and spicy pumpkin pie with tangy cheesecake for a fall flavor that's sure to please any crowd this season. Get Food Network's full recipe here and wow your guests as soon as you slice into the beautiful baked good. Make herb bundles! Toss these in soups, in stews, on a sheet pan with root vegetables or simply throw in a pan with some oil. Turn off heat let infuse/steep for about 30 min then jar and keep up to 30 days. Utilize a sheet pan. Roast big batches of hearty squash, root vegetables and eat them simply seasoned or give them a whirl in the blender and use as a puree or base for soups and stews. Grinshpan suggests roasting on a very high heat to get char anc caramelization. "I roast at 425 degrees and higher," she said. "I also love braising with all types of seasonings. It infuses the flavors into the veggies very well." Don't be afraid to add spices to build warm flavors that will add depth of flavor to any dish. Let fresh produce like apples, grapes and pears shine on their own. 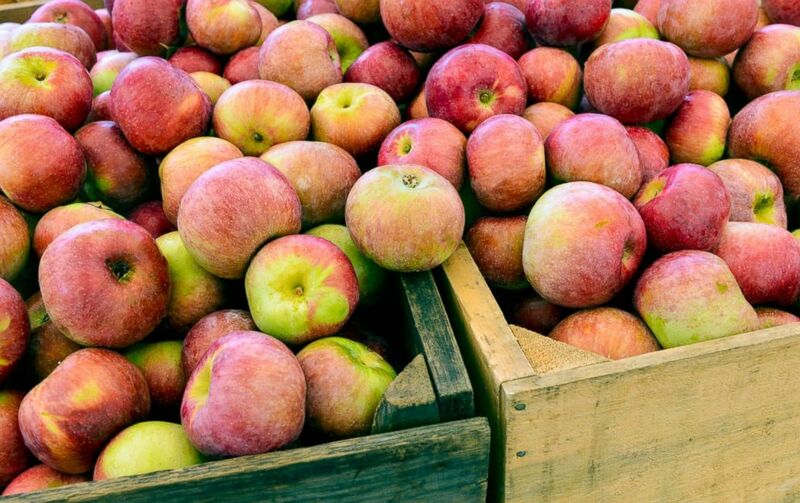 The full flavor of a fresh picked Gala or Honeycrisp apple is perfect without accompaniment. 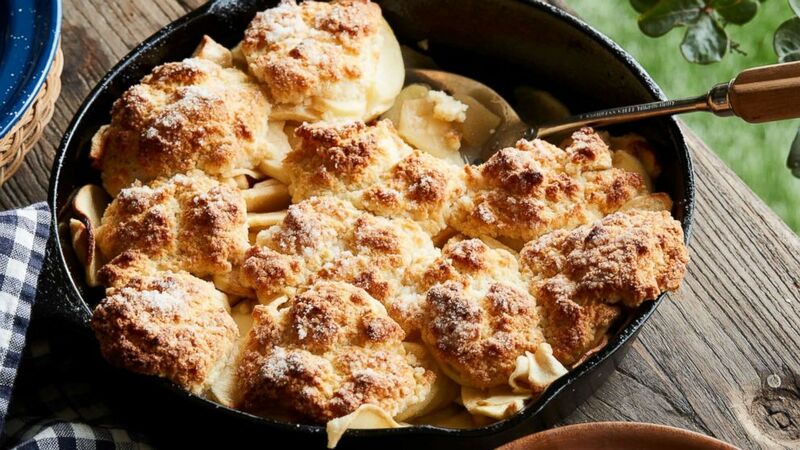 For big fans of that crisp, sweet, baked apple flavor, here's a smoked apple cobbler recipethat is sure to fill plates, and homes, with scents of fall. Food Network Kitchen shares this smoked apple cobbler recipe.